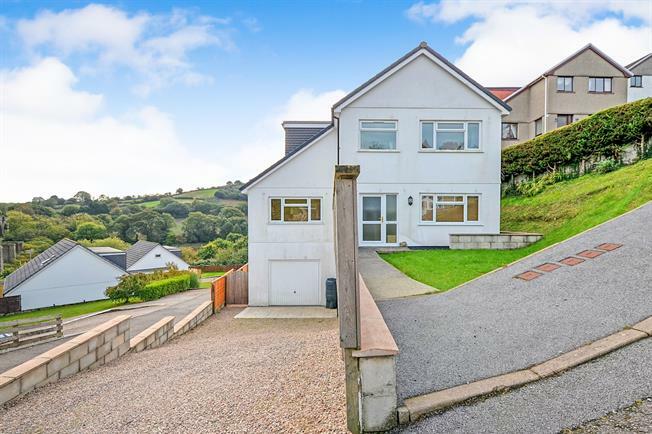 4 Bedroom Detached House For Sale in Penryn for Guide Price £360,000. A great opportunity to purchase this spacious and substantial four bedroom, detached house with elevated south easterly views to Polsethow's historic viaduct and the countryside beyond. The property benefits from double glazed windows throughout, gas central heating, master bedroom with en-suite, a good size garage with driveway and enclosed garden. Beyond is additional land which, subject to planning permission, gives potential flexibility for a building plot, a home office or garden room/studio. Polsethow Vale is a peaceful, quiet cul-de-sac with very little traffic and being close to Penryn station, is for easy commuting to Falmouth and Truro. Viewing is highly recommended to truly appreciate what is on offer. Double glazed front door into entrance hallway, double glazed window to front elevation. Doors to all ground floor accommodation, carpeted stairs rising to first floor with good storage space under. Radiator and skirting boards. This two piece suite comprises of a close coupled w/c, pedestal wash hand basin with mixer tap and tiled splash back. Radiator, skirting boards, wood effect vinyl flooring. A wonderful triple aspect room with double glazed windows to front side and rear with superb elevated views over the surrounding area. Radiator, telephone and television points, skirting boards and carpeted. Doors to all first floor accommodation, access to loft space which is partially boarded and has a pull-down loft ladder. Double glazed window to front elevation. Radiator, skirting boards, door giving access to en-suite. Three piece suite comprising of a corner shower cubicle with shaped clear screening and electric shower and fully tiled surround, close coupled w/c, pedestal wash hand basin with tiled splash back. Ladder style heated towel rail, extractor fan, inset spot lights, skirting boards, vinyl flooring. Double glazed window to side elevation with surrounding countrywide views. Radiator, skirting boards. Double glazed window to rear elevation with surrounding views. Radiator, skirting boards. Double glazed window to front elevation. Radiator, skirting boards. Obscure double glazed window to rear elevation. Three piece suite comprising of a panelled bath and handled bath with shower over and tiled surround, close coupled w/c, pedestal wash hand basin with tiled splash back, ladder style heated towel rail, skirting boards, vinyl flooring. Large integral garage door with metal up and over door to front, power and lighting, wall mounted electric consumer unit, wall mounted gas central heating boiler. To the front of the property is a driveway facilities for two vehicles which in turn leads to the garage. The front garden is mainly lead to lawn with pathway leading to front door. To the rear of the property the garden is mainly laid to lawn incorporating a variety of mature shrubs, plants and flowers incorporating an elevated decked terrace area which enjoys a sunny southerly aspect and outlook over the surrounding area. Gravelled pathway gives access to front, enclosed by timber fencing, beyond the boundary fence at the rear is an additional untended wooded area of garden which offers a fantastic opportunity for a potential building plot ( subject to the necessary planning permission and consents).